Fall is in full swing here at Cheng & Tsui’s Boston office. Last week, the crisp chill in the air and the sight of brilliant foliage on Boston Common had me digging my hot water thermos flask (保温杯 bǎowēn bēi) out of my kitchen cupboard. After several years spent abroad in Beijing, I’ve grown to enjoy drinking water the Chinese way--piping hot. If you ask for water in a restaurant in China, you’ll be presented with a steaming glass of the stuff. Unlike in the United States, it’s considered unusual to put ice cubes in your water. Hot water (热水, rè shuǐ), served just below boiling temperatures, is the standard. 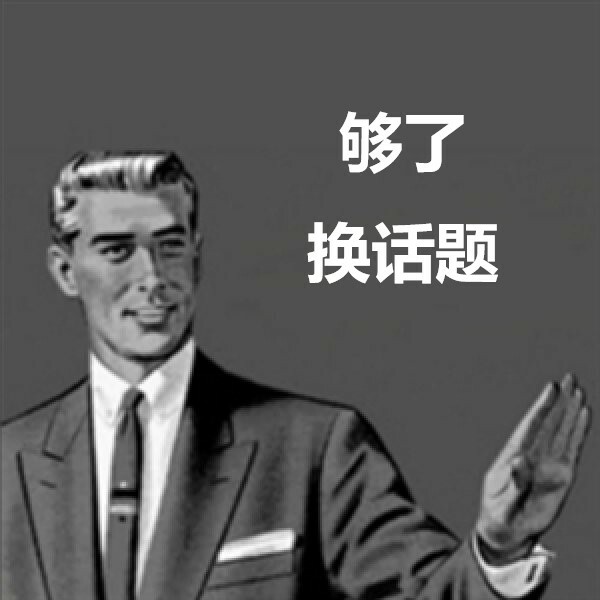 If you’ve ever caught a cold while living abroad in China, or while in the company of a Chinese friend or relative, you’ve likely heard someone say: 你喝点热水吧 (nǐ hē diǎn rè shuǐ ba)! Translation: drink some hot water! This piece of advice is doled out to anyone who is feeling unwell for just about any reason. So why do Chinese people prefer hot water to cold water? Hot Water is Good for You! In traditional Chinese medicine (中医, zhōng yī), hot water is used to expel excess cold and humidity from the body, and it is believed to promote blood circulation. This helps detoxify the body and relax the muscles. Cold water supposedly has the opposite effect, slowing organ function and causing painful muscle contractions. Thus, hot water is often touted as the cure for everything from sore throats to stiffness to cramps to fatigue. Though the idea that drinking hot water is good for you has been around since at least 200 BC, it wasn’t a widespread practice in China until relatively recently. In ancient China, poor living standards and the high price of fuel meant that hot water was considered a luxury. However, when a cholera epidemic broke out in northern China in 1862, the popular explanation for why the south was spared was that (historically wealthier) southerners tended to drink boiled water. After that, the practice of drinking hot water was incorporated into the public health campaigns of both the Nationalist and the Communist governments. Today, it’s just good practice to boil water before drinking it. Even in large cities like Beijing and Shanghai, tap water (生水, shēng shuǐ) in mainland China isn’t safe to drink. 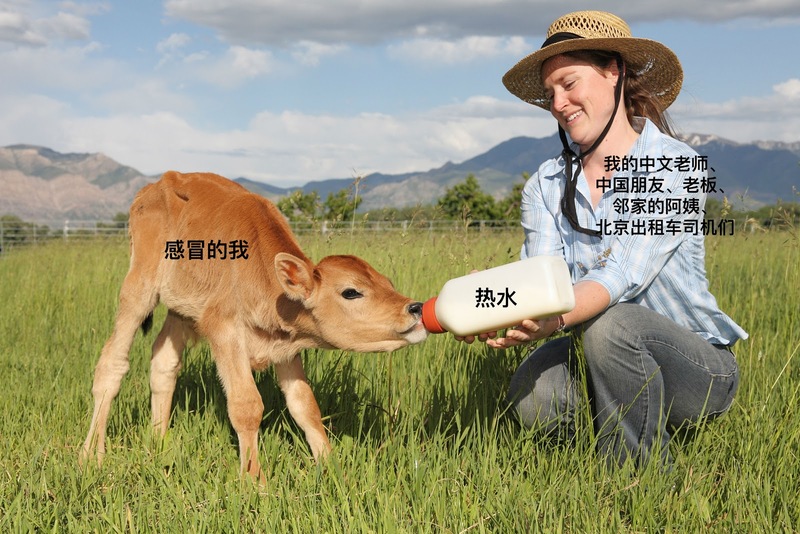 If you aren’t careful, you can end up with a bad case of diarrhea (拉肚子, lā dùzi). Nǐ zěnme la? Nǐ kànqǐlái xiàng shì shēng bìng le. What’s wrong? You look ill.
Wǒ zuótiān hē le shēng shuǐ, xiànzài lā dùzi. I drank tap water yesterday, and now I’ve got the runs. 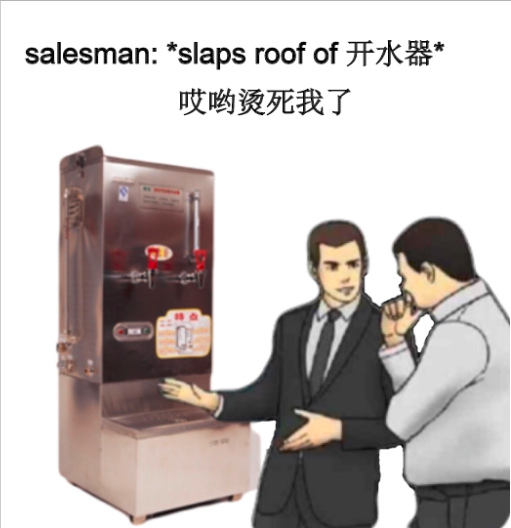 Today, just about every school, business, and government office has its own hot water dispenser (开水器, kāishuǐ qì), from which employees and visitors alike can draw their own hot water for drinking. Some of these dispensers are small enough to sit on a kitchen counter, but some are large enough that they require special boiler rooms (开水间, kāishuǐ jiān). In many workplaces, these boiler rooms function like the small kitchens or break rooms in Western offices. At home, tea kettles are more common. In fact, one of the most common complaints Chinese tourists have about foreign hotels is the lack of hot water dispensers or tea kettles. The British may have invented thermos technology, and the Germans may have commercialized it, but the Chinese have perfected it. That Chinese thermos in my kitchen cupboard? I once filled it, forgot about it, and left it in a classroom overnight, and the next morning the water inside was still hot! 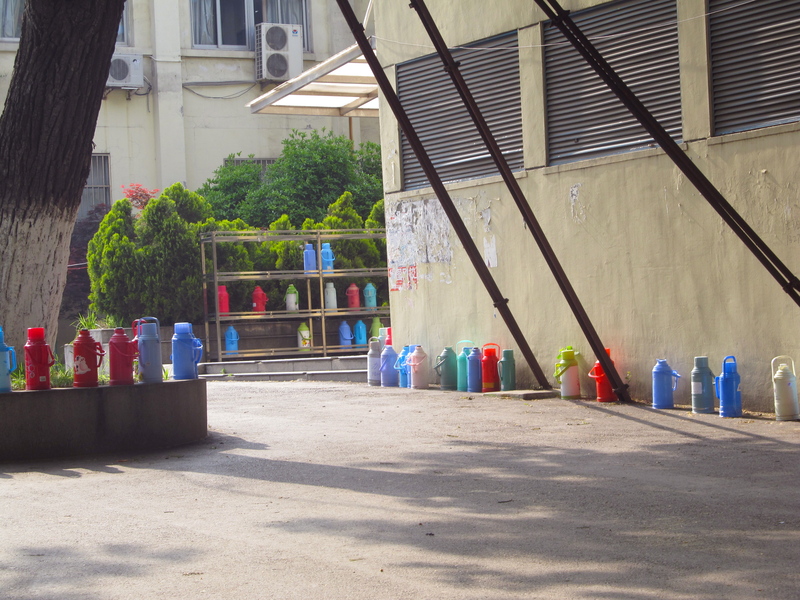 Even the large thermos bottles (热水瓶, rèshuǐpíng) pictured above can keep water at blistering temperatures all day long. In China, students will fill up a large thermos and bring it back to their room so they have water conveniently ready whenever they need it--whether it’s for making tea or drinking by itself! While hot water and other hot beverages remain the norm, Chinese consumers’ taste for cold and iced beverages has grown in recent years. 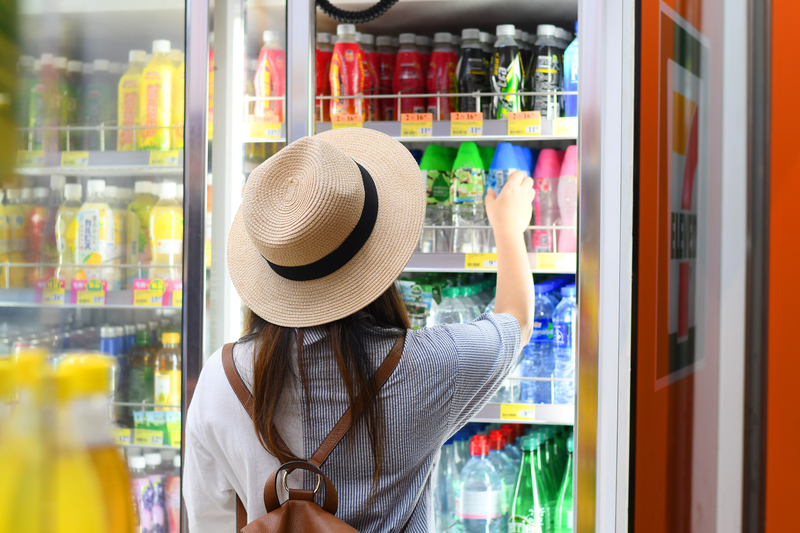 Walk into any Chinese convenience store or supermarket and you’ll see refrigerators filled with ready-to-drink tea, coffee, juice, and sports drinks. Still, if you order a soda at a restaurant, the server may ask you, “汽水要冰的还是常温的？(qìshuǐ yào bīng de háishì chángwēn de? )” Would you like your soda cold or at room temperature? As a born and bred Bostonian who drinks iced coffee all winter long, the idea of drinking a room temperature soda makes me shudder, but for many Chinese people, it’s still preferable to a cold or iced beverage. 1) When boiling water, make sure you bring the water to a roiling boil for at least one minute. It’s tempting to hit the switch on an electric tea kettle a little early, but it’s important to make sure all pathogens in the water are actually dead. Otherwise, you run the risk of an upset stomach. 2) The tanks of hot water dispensers are so, so much hotter than you think they are. Don’t touch them!! You will regret it.